How do Mutual Funds work to grow your wealth? 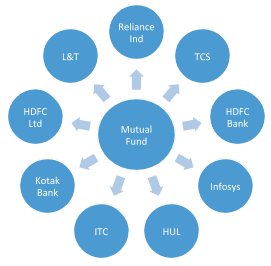 Mutual Funds (Equity oriented) are essentially vehicles which hold ‘shares’ of various companies. For many people, a mutual fund is a ‘black box’, a sort of a vehicle where one would invest. It has a price which goes up and down. If one considers mutual funds a black box, without knowing what really happens inside a mutual fund, then one would find it difficult to hold on through long periods of time. As Buffett once said – Risk comes from not knowing what you are doing. What are Mutual Funds, and more importantly how do they work? Mutual Funds (Equity oriented) are essentially vehicles which hold ‘shares’ of various companies. There are many successful companies in India, addressing the various needs of the Indian economy. The ‘shares’ of these companies are listed on the stock exchange, such as BSE or NSE. When you buy a unit of the mutual fund, the money is used to buy parts of these companies. The following illustration shows a Mutual Fund with the Top 10 companies listed in India and also the most widely owned. In reality, 80% of all equity mutual fund assets are spread across about 150 companies. How does a Mutual Fund grow your money? Mutual Funds tend to do well, if the companies they hold do well. Since equity Mutual Funds own ‘shares’ of some of the leading companies, the growth in the value of these mutual funds is linked to the growth in revenues and profits of these companies. Obviously, there is little more to it, but one can leave it to the professionals to manage that. Here’s the performance of some of the leading companies in India over the past decade. It has been phenomenal, to say the least. As these companies have grown, so has the value of their shares and in turn the wealth of the investors, including mutual funds, owning these shares. How can we say that the companies are doing well? Because the economy is. The good companies in the economy should do as well as the economy, if not better. The Indian economy is one of the fastest growing economies in the world, growing at close to 12% pa in nominal terms, and it is expected to do very well for years to come. 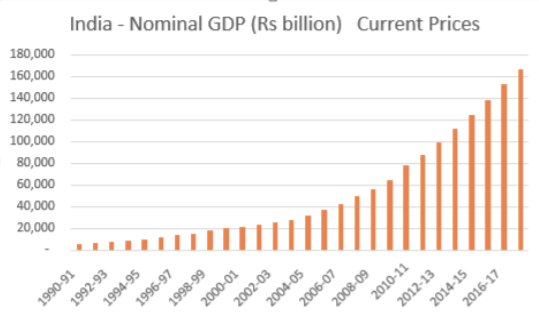 The incremental growth in the economy in 2018 alone was equal to the size of the economy in 1996. This path of progress is here to stay. The growth is driven by one of the largest pool of young people, who are up-skilling themselves and creating more value for themselves as well as for economy. Want to create wealth? Start by owning great companies, indirectly. In summation, Mutual Funds are essentially a vehicle for you to own ‘shares’ of some exceptional companies in India and participate in the long-term progress of the nation. If the Indian economy does well, which it will, then one should participate in this journey. The best way to do so is to buy a slice of great companies. If you can’t do it all on your own, hire a professional to do it for you - which is exactly what a Mutual Fund Manager does for you. Home › Finance Blog › How do Mutual Funds work to grow your wealth?